This Ukrainian-American girl (whose name has unfortunately been lost to time) was part of a large group that posed for a photograph in front of the Ukrainian Orthodox Church in Butler, Pennsylvania in 1925. 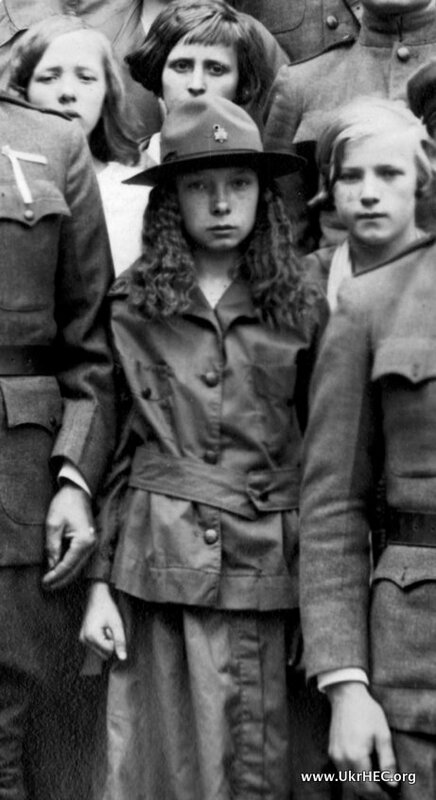 We had the opportunity to show this image to an archivist at the Girl Scouts of the USA, and she was able to confirm that this is indeed a typical uniform for an American girl scout of the 1920s. There is some variability in the uniforms of this period, as the girls were expected to sew their own. Unlike the children of post-World War II refugees (who typically participated in distinctly Ukrainian youth groups such as PLAST, the Ukrainian Youth Organization, or the Ukrainian Democratic Youth Organization), Ukrainian-American boys and girls of the 1920s and '30s were much more likely to join American scouting organizations.